In the Spotify window, choose File→New Playlist Folder. A text box appears on the left sidebar. Type your folder name in the text box and press Enter. Drag and drop playlists into the folder to file them away. Essentially, if you’re already familiar with creating folders on a computer and dragging documents into them, you should feel right at home here. To create a subfolder that nests inside a folder, follow the same folder-creation technique, and then drag and drop your new folder into the parent folder (the folder that you want to contain your new folder). To add playlists to a subfolder, double-click the parent folder to display the subfolder, and then drag your playlist into the subfolder. You can also create sub-sub-subfolders — but going any deeper than that might get confusing and hard to navigate if you have to constantly click folders to get to what you want! If you have a complex folder structure, you can add playlists to any subfolders without having to keep clicking to open each folder. Drag your playlist over the parent folder, and after a couple of seconds, the folder springs open, displaying the subfolder ready for you to drop the playlist (repeat the process if you have a deeper folder structure). You can also drag and drop an existing folder, complete with playlists, into a parent folder to turn it into a subfolder. To view all playlists in a folder, hover your mouse over the folder’s name to display an arrow pointing to the right, and then click that arrow. Alternatively, double-click the folder name. The arrow now points downward, indicating that the folder has been opened. Subfolders can be opened and viewed in the same way (if you have any). After you move your mouse away from the left sidebar, the arrows turn into a sort of musical sheet symbol layered on another sheet, which indicates that they’re folders rather than individual playlists. 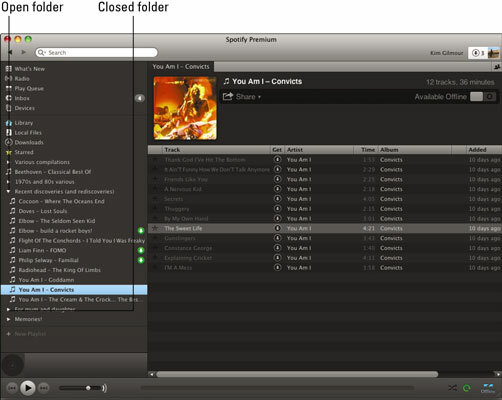 You can place playlists and playlist folders only below the Starred icon on the left sidebar of the Spotify window.